The Pianta captain appears to be the boss of the sailors and workers at Ricco Harbor. 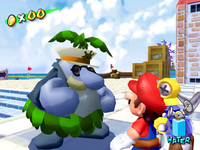 During Super Mario Sunshine, he appears at a different area of Ricco Harbor in each episode set there. When Gooper Blooper returns to Ricco Harbor to cause more trouble in Episode 5, the Captain sends Mario to dispose of it while he waits from a safe distance. Later in Episode 6, the Captain takes all the credit for defeating Gooper Blooper, causing an overly gullible worker to call him a hero. The Captain can also be found at Gelato Beach, but only in three episodes. He is first seen at the smoothie bar in the Surf Cabana, where he asks Mario "Have we met before? So familiar?" and then encourages him to defeat the Wiggler. He later shows up as one of the spectators waiting at the finish line for the race with Il Piantissimo, and participates in the watermelon contest during the Watermelon Festival. Apparently, he tricks one of the other contestants into switching watermelons with him. This page was last edited on February 16, 2018, at 02:19.